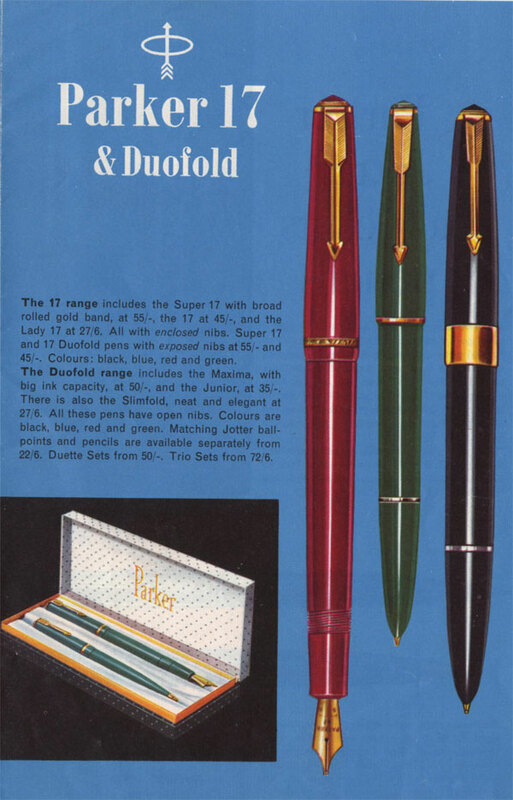 he first British Duofolds were manufactured during the early 1930's and followed the US designs, but they very soon started making pens in a wide variety of designs and colours: lizard skin designs in pink/black, brown/black, green/black and pearl/black; marbled designs in: golden/pearl, blue/pearl, red/pearl , dark brown/pearl, green/pearl, golden/green, brown/black and golden/blue. They were produced in the same sizes as their American predecessors and were all of the (1929) streamline style. Sometimes these pens had Vacumatic nibs with the archers arrow on it, this somewhat confusing to later day collectors. In 1946 a new Duofold was introduced, the Duofold NS, New Style. This pen was fitted with an arrow clip and the old ball ended clip was discontinued, the clip screw was made of the same colour of plastic as the pen. It was still a button filler and sported a tassie ring on the blind cap, like the early Vacumatics. With these pens the engraved cap band found on the Major Vacumatics (app 4 mm) survived, a pattern of repeated chevrons leaning alternatively right and left: ///\\\///\\\. he NS Duofold was also manufactured in Denmark by Christian Olsen, who was the first distributor of Parker pens outside the US, dating back to 1905. Olsen had produced Parkers for many years and also had his own brand, the Penol. The Danish Parker's are imprinted either with th Olsen logo, an anchor and the letters CO, inside a ring, or (later) MID (for Made In Denmark). Some Danish items also has a special split arrow clip with the imprint "Parker". The Danish Duofold NS were manufactured in Black, Burgundy and Olive Green and possibly in Chocolate Brown. In 1948 the Duofold was changed again when the metallic button on the filler was transformed into an aluminium rod, rather than a button as such. This new pen was called The AF Duofold, aluminium filler. 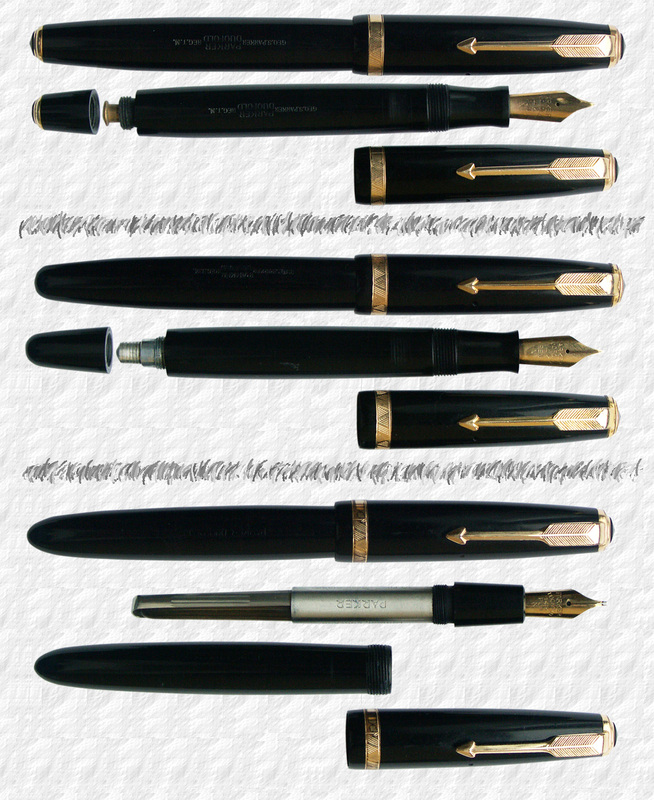 With this pen the tassie ring was also discontinued and the blind cap became rounded, like on later Vacumatics. Parker began offering matching pencils aswell. The colour scheme was also simplified. Images © and courtesy of Adamon. Another similar line was also produced in France during this time, Parker La Plume. The Senior, was also introduced in 1948. This followed the UK Duofold AF line, only it was bigger. Also a new, shorter model, the Demi Duofold was introduced in 1953. It was closely followed in 1954 by the Senior Duofold. n 1956 a cap actuated ballpoint with plastic cap and barrel was introduced at £1.05. Early Duofold ballpoints had a plastic barrel with threads at one end with a metal nozzle at one end and a metal collector at the other. The cap screwed on to the connector. But by the time the Duofold ballpoint was mass produced it was redesigned with a simpler one-piece barrel that sported a pushfit metal nozzle tip and screwed on directly to the cap. In 1958 both the Demi and the Senior were discontinued. The very large Maxima was introduced with the aerometric filling system. And the same year a smaller sized pen, the Lady Duofold, this had a hooded nib. ate in 1961 two new standard sized models, the Parker "17" and the Parker "17" Super were introduced (ca 137 mm, closed). They was the first pens made in Newhaven to be produced with the new manufacturing process of injection moulding. They were simple economy pens with slip-on caps. The lower priced Parker "17" had a thin cap ring, while the Super "17" had a wide cap band. 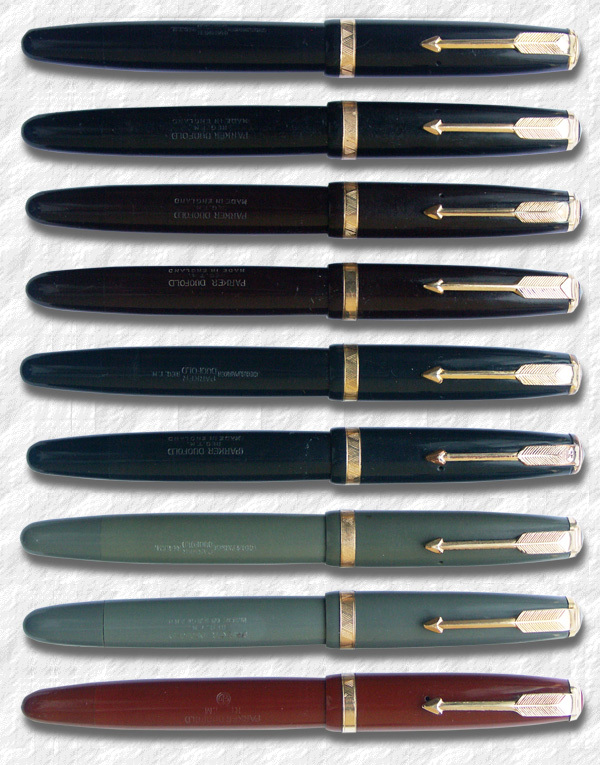 Ballpoints were also offered to match the fountain pens and pencils of both models. Both had a slip-on cap, as opposed to the rest of the European Duofold line of the 1960's. They also sported a new style clip with more tapered feathers. The early models also had an open, beak-shaped 14k gold nib. The ends being wider and more pointed than later models, not unlike the Danish Parker Popular of the 1950's.They were offered in the four standard Duofold colours of the time, Black, Blue, Red and Green. 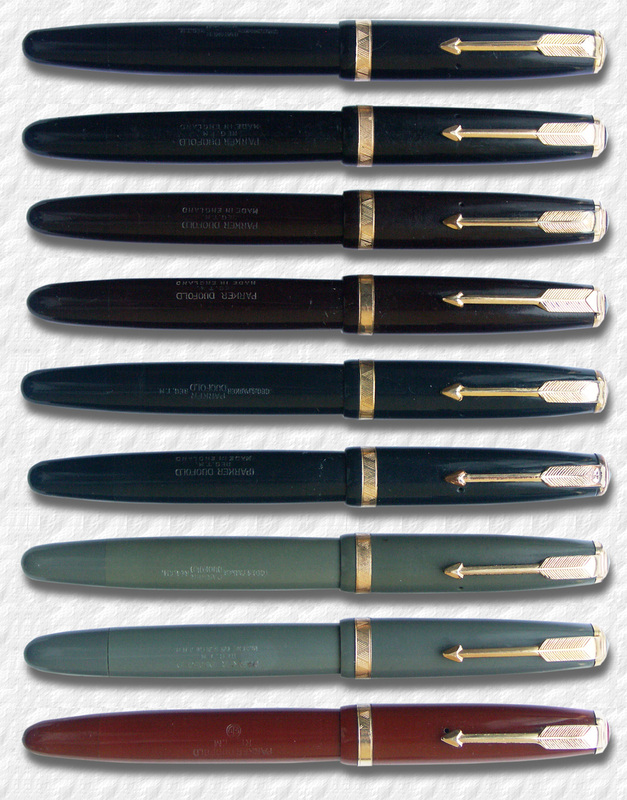 These pens also sported metal cap grip-rings on the body. Twist-operated pencils were also offered. They replaced the Standard Duofold, which was discontinued. 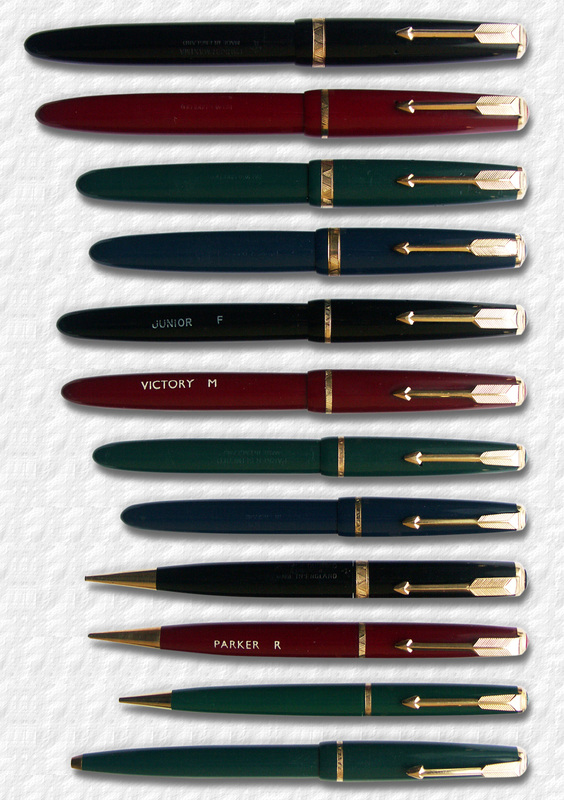 In 1962 one of the best sellers from the British Duofold line, the Slimfold was introduced together with a smaller version of the standard Duofold, the Junior, The Parker "17"', the Slimfold and the Junior all sported a thinner cap band (app 1 mm) but it was still engraved in the same manner as the cap bands on the earlier pens. ike the rest of the British Duofold collection of the 1960's they came in the four solid colours of Black, Red, Blue and Green, the green being the most uncommon. The Slimfold was 113 millimeters long and had a small gold nib, a gold plated arrow clip with the feathers being very narrow, and also a narrow gold plated cap band with engraved chevrons. Regarded a ladies pen it's an excellent writer with the modified "U" aerometric filler. The Parker "17" and the Parker "17" Super both initially had open nibs but in 1964 the nibs on both models became hooded, although for a time they were offered side by side. They were not tubular in the manner of the Parker "51's", but still hidden under a plastic lip. 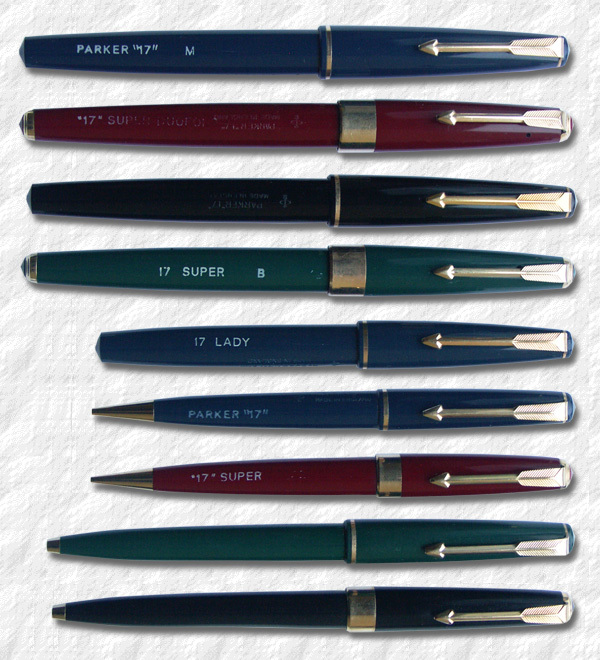 The same year a Lady "17" was introduced and the "standard" Parker "17" was now referred to as the Model "17". They were offered with matching pencils and Jotter ball pens. n 1967 a high end Lady Duofold was introduced with rolled gold cap and barrel, the Lady Insignia. The Lady Standard was introduced in 1968, It was very similar to the Lady "17", but had a longer section. The same year the cap and clip was redesigned on the Lady, Slimfold and Junior, it was now much straighter and sported a Parker "45" style clip. Also in 1968 Parker gave up on the Eversharp sub brand and all the unprofitble Eversharp models were discontinued, the Challenger, Big E, 10,000 and Reporter. 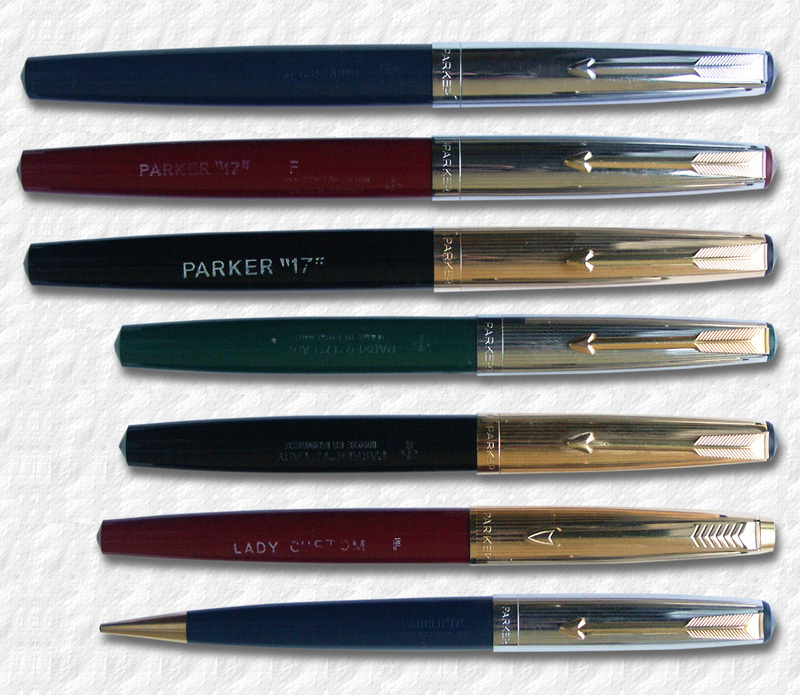 Instead Parker introduced a cheaper metal-capped version of the Parker "17", the DeLuxe. They were offered either with chrome or gold filled trim. 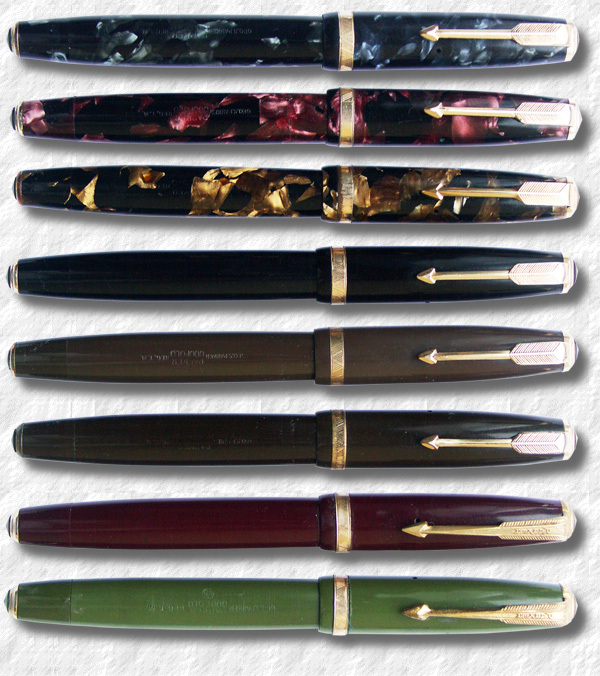 The GFT-pens also had gold nibs, while the CT-pens had cheaper steel nibs. Later also a custom version with a gold filled cap and trim was introduced. Interestingly enough the at least the CT-version was produced in France and the parts, save the nibs, can not be interchanged. In late 1971 the Slimfold was redesigned yet again, maybe only to confuse latter day collectors. It now became very similar to the Parker "45", so similar in fact that it's kind of hard to differentiate between the two. The New Slimfold was 122 millimeters long with the cap on, as compared to the Parker "45" which was 136 millimeters in lenght. It also had the Parker "45" nib assembly and clip and since both pens are cartridge fillers the most significant difference is the screw-on cap of the New Slimfold, as opposed to the slip-on cap of the Parker "45". he cap had the imprint Parker/Made in England and the body was marked with NEW SLIMFOLD in chalk, but when this have been brushed off, it could be very hard to identify the pen. 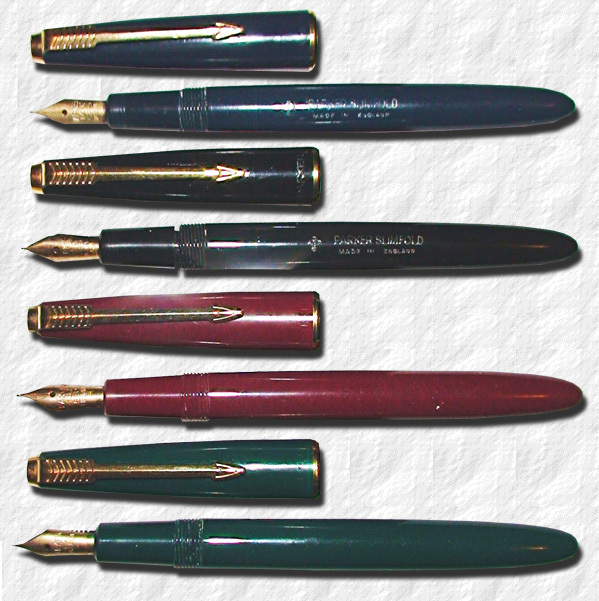 Even though they have handled time well, being sturdy, seldom failing writers as well as often being fitted with nice semi-flexible nibs, the British Duofold collection has somewhat failed to capture the minds of the collector community, save the Maxima which is very much sought for, but the rest of the line can still be found relatively cheap. Their only faults are a tendency to discolour if left for a long time in direct sunlight and being somewhat prone to developing dull finishes, due to the polystyrene plastic being softer than both celluloid and acrylic. They will never have the reputation of the high end Parkers, but with real gold nibs and as an introduction to the fountain pen users community, the European Duofolds of the era is well worth the prices they fetch. Since the size is the easiest way (apart from the imprint) to differentiate the models, here's a chart. Three generations of UK Duofolds. Images © and courtesy of Gerald McMullon.